Step 2: Hold the cinnamon stick as you would a crayon, and “color” the gingerbread man with a cinnamon stick until it’s completely covered with cinnamon dust, or whatever you want to call it. This will give your ornament a wonderful scent. Step 3: Cut out the gingerbread man, and punch a hole toward the top. Lace raffia, ribbon, or string through the hole and tie a bow. Step 4: If you wish, you can add a face using crayons, or you can simply leave it plain. 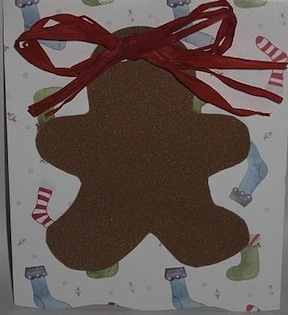 You can also glue the gingerbread man onto a decorative paper background. Read more here.